The user guide is still being constructed. If you have a question about a topic that is not covered here, please contact us. How can I unregister SnapGene on the computer I am currently using, freeing the license for use on another computer? 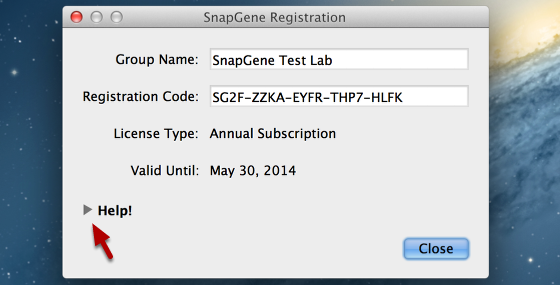 To open the Registration Dialog, click SnapGene → Registration (Mac) or Help → Registration (Windows). Expand the Registration dialog by clicking the "Help!" triangle. Choose "I would like to unregister this computer." SnapGene will no longer run on the same computer unless you register again. 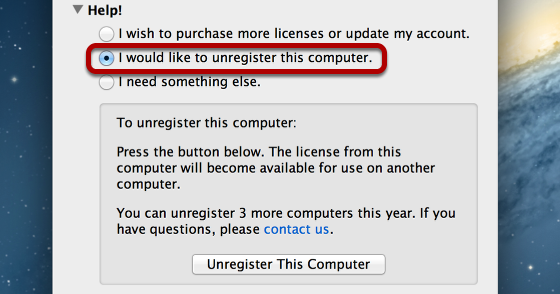 The license is available for use on another computer.